Undone by the casting of slow and wobbly Arnold Schwarzenegger, this is simply a very sad Hollywood debut for renowned and wholly inspiring Korean director Kim Je-Woon, of ‘I Saw the Devil’ fame. We only have to look to Chan-wook Park's brilliant Stoker as a superior example of a successful Asia-to-American transplant. Unfortunately it’s not all Woon’s fault, it’s Arnold’s aged and lumbering frame, and gloriously faded star power which weighs down this picture. As the small town sheriff who comes out of his shell to capture a nefarious drug dealer prison escapee who had evaded the FBI at every turn, Schwarzenegger’s character Ray Owens (really? That’s his name?) promises to be a late career John Wayne turn as in True Grit. But we can only see the shadow of his former self. The action commences when Eduardo Noriega playing a Mexican drug lord escapes dramatically from the clutches of the FBI, leaving the scene in a spectacular piece of product placement, a Chevrolet Camaro ZL1 pimped out to be an ultrafast high performance vehicle. In fact, Noriega spends most of the film in the car driving at excessive speeds. 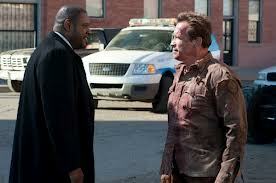 Forest Whitaker playing the agent in charge is pissed off and is thwarted at every attempt to corral the drug dealer. Thus, as the Camaro speeds south toward the border it’s clearly on a collision course with Arnold Schwarzenegger and his sleepy town of Sommerton Junction. The structure of the story plays wonderful homage to some of the great Westerns such as High Noon, 3:10 to Yuma and the films of Budd Boetticher. Much of the attention and the action sequences are paid to the fast car and the numerous escape attempts at the various police stops along the way. Unfortunately Woon’s visual bravura, exemplified in both I Saw the Devil and The Good, the Bad, the Weird seems hogtied, resulting in rudimentary and simply adequate action choreography. In Sommerton, Arnold investigates a looming threat by new baddie in town Peter Stormare, a connection which will eventually link up to the drug dealer. The gunplay action in the town suffers from the same restraint as the chase sequences. Some of Woon’s gonzo humour from The Good, the Bad, the Weird shines through. Casting of Luiz Guzman as the straight man goes a long way and Johnny Knoxville as the resident gun-toting weirdo seems just right. Arnie’s cobbled-together team of deputies also includes the handsome and interesting Rodrigo Santoro from Lost and Friday Night Lights’ Zach Gilford, all of whom seem honest and believable. Unfortunately, it’s just Arnold which fails this picture, wobbly and slow, and a long way from his commanding presence as the action superstar of the 80’s and 90’s. The Last Stand is available on Blu-Ray from Eone Home Entertainment in Canada.